A group of Polisario militiamen have managed to steal four Toyota military vehicles from barracks in the Tindouf camps, kidnapped the head of the Polisario special units and tried to head to the Malian front but they failed in their attempt. The fugitives were planning to join Al-Mourabitoun jihadist group, which is operating in Mali under the leadership of Algerian terrorist Mokhtar Belmokhtar. 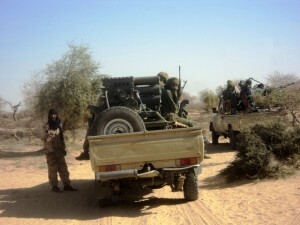 The four vehicles equipped with transmission devices and light weapons (machineguns and ammunition) were stolen on March 4, from barracks in Rabouni, by a group of militiamen who fled by night trying to reach northern Mali, a reliable source from Tindouf reported. But the fugitives had to abandon the four vehicles after the Algerian army deployed mobile units that barricaded all the passageways to Mauritania and Mali, the same source told the e-journal Le360.ma over the phone. The unidentified militiamen have nevertheless managed to take with them all the transmission devices and arms that were on board. The empty four military vehicles were found Sunday March 8, at some170 kilometers from the “wilaya of Dakhla” camp. The authors of this operation, deemed very daring in view of the blockade imposed on the Tindouf camps, were planning to hand the weapons as well as their hostage to Al-Mourabitoun group as a token of their allegiance to Mokhtar Belmokhtar. Many Sahrawis who deserted the Polisario armed militias have rallied the Jihadist groups operating in Mali. After it was partially decimated during the “Serval” offensive launched at the initiative of France in January 2013, Al-Mourabitoun terrorist group merged with the Movement for Oneness and Jihad in West Africa (Mujao) and is now trying to regain its strength by attracting new recruits.